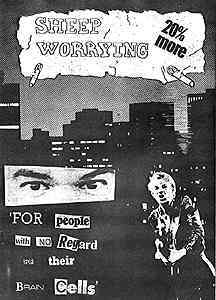 Bridgwater's most successful attempt to date at collectivising punk anarchy and overthrowing the Dark forces of Reaction that held progress in check in the town--started off as a fanzine for punk band The Dangerous Brothers. On September 7 1977 the first edition of Sheep Worrying Magazine was brought out as a promotional tool for the DB's social scene. At every subsequent gig a new edition came out. Irreverent and anarchic it was put together by Smedley as editor, Rod Jones-as overall visionary and with art work from Dave Newton plus consistent articles from Kim Newman & Eugene Byrne it was eagerly snapped up. In 1980 Jones and Smedley devised the concept of 'Sheep Worrying Enterprises' which was conceived of initially just to promote the Dangerous Brothers but after several brainstorming sessions it's potential value as a force within the community to make things happen and organise creative people in a supportive environment became clear. In April 1980 the Dangerous Brothers single 'False Nose/County Councillor' was released on the Sheep Worrying label. Sheep Worrying-now distributed by Rough Trade, became recognised as an indie label around the world through the underground 'alternative' network. In the summer of 80 the Bridgwater Youth theatre had been disbanded in the first wave of Tory cutbacks.Many of it's members were part of the DB's scene. Smedley and local writer Kim Newman co-operated on a stage musical-written by Newman with songs by Smedley and based on ideas from within the group and formed their own theatre company 'Sheep Worrying Theatre' featuring members of the defunct youth theatre to put on the show 'Another England' about a Nazi take-over of the country which was performed at the Art Centre in September 1980. The play was so popular that the group immediately produced another play ''The Scandalous History of the reverend Henry Prince and his abode of love'-written by Charlie Mander and featuring Newman in the lead role. 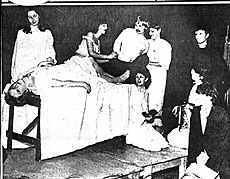 The play was a key choice as it had been banned by the Bridgwater College Principle JC Miles, when the Youth theatre had attempted to do it. The show was a sell out And the idea nicked by Charisma films for its movie 'The Missionary'. 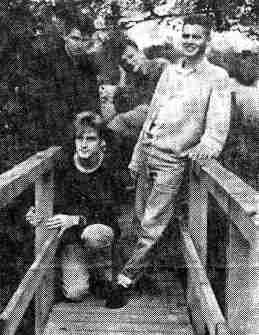 In August 1980 Smedley co-ordinated contacts from bands all around Somerset to produce a less DB's orientated Sheep Worrying magazine and upped circulation to 500 and then to 1000 now using the fanzine as a focus for bands all over the county filling a glaring gap in the local music scene. By 1981 the magazine was coming out monthly and circulating from Bristol to Exeter-being featured on the BBC west TV programme 'RPM' , demonstrating that things were happening outside of the cities. In September 1980 Smedley got the Arts centre temporary manager John Ridley, to agree to letting Sheep Worrying run the Arts centres rock music programme-building on the work done by former manager-and now nervous breakdown casualty Bob Ormrod in developing the Arts centre as a rock venue. The Sheep Worrying group stipulated that only bands playing their own music should get the gigs. It was this radical step adhered to in the face of stiff opposition that kept the place accessible to local bands, inspired bands to form and reform and maintained an average of 4 original local bands a month playing the Bridgwater Arts centre. In 1982 pressure to include name or semi-name bands led to s temporary split and compromise and thereafter many up and coming names from the Indie scene played the Arts centre under the Sheep Worrying banner. During this time Sheep Worrying brought out 3 cassette compilations of local bands 'Tubular Sheep' 'Dark Side of the Sheep and 'Magical Mystery Sheep' and also ran an alternative film club and 2 'festivals of Alternatives' including an outdoor football & rock festival at the YMCA. Sheep Worrying Theatre group managed to perform at least 3 plays a year by local writers as well as staples Newman and Mander. In 1984 Stuart Croskell won the Somerset original Playwrighting award with his play 'Harry' and the followng year it was Dave Butland with 'Real Fiction'. In 1984 the Sheep Worrying organisation became more overtly political with the heightening of the Class struggle in the country and the vicious attacks nationally by the Thatcherites and their local supporters. Tory councillor Margaret Rees, who bought the house next the arts centre labelled it's rock audience 'Jive- joint wierdies' and campaigned to stop discos, rock music, and later amplified music there-finally succeeding in the 1990s after Sheep Worrying had gone. Articles in Sheep Worrying magazine satirising Police violence and caricaturing local Tories , led to the District Council withdrawing Sheep Worryings Grant. Trouble at gigs caused by National Front skinheads from out of town led to increasingly tough conditions imposed on the gigs by the Art Centre board of Management. Smedley was described by senior Tories as 'The most Dangerous man in Somerset'. In fact he probably wasn't. A series of Bridgwater 'socialist' history plays written by Smedley from 86 to 88 supported by a couple of booklets followed from the 1985 'community play' The Kings Justice by Charles Mander which was test run by Sheep Worrying. Brickyard Strike, The Siege of Bridgwater and The Vernon Bartlett Show were followed in 1989 by 'Jack and the Poll tax' a satire on the big issue of the day. Sheep Worrying magazine reached issue 52 before folding.